Equipped with a retractable handle and caster wheels, it is easy to move from room to room. It has a user-friendly control panel with a 24-hour timer, digital humidity readout, and control lock. It might be difficult to reach a drainage hole. If you need to get rid of excess moisture in large premises with high humidity levels, this Frigidaire dehumidifier will handle this task fast and effectively. When the moisture removal cycle is completed, the device enters a 3-minutes-long rest period. 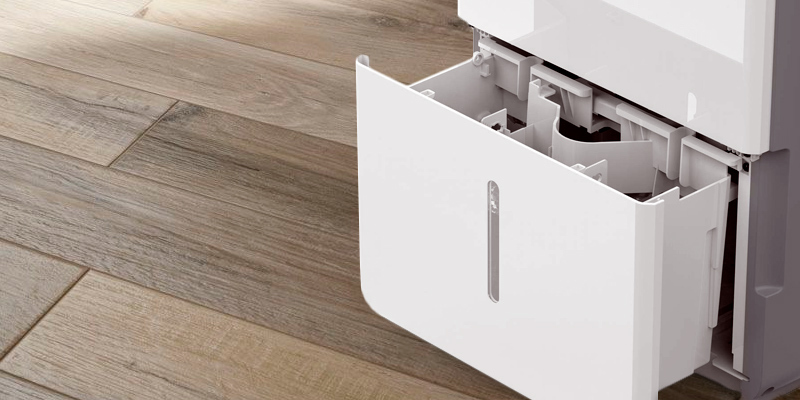 This feature prevents the unit's overheating and adds to its durability. Some users are not quite happy with the quality of the included water tank. Designed to dehumidify large areas, this model effectively helps to prevent mildew growth. The item has an ergonomic touch control panel with an LCD screen and is easy to move around thanks to the built-in handles and wheels. This VREMI model has a turbo mode that can help you fasten the dehumidifying speed from 129 up to 138 cubic feet per minute. In such a way, you will be able to remove excess water from the air more quickly. The built-in handles are somewhat small. Energy Star certified, the appliance is a reasonable choice for effective dehumidifying of smaller areas. It is simple in use, energy-efficient, and easy to maintain. A more powerful 70-pint model is also available. The unit boasts a capacious (16.3 pints) water tank equipped with an ergonomic handle for easy removal and carrying. Energy Star certified, it will help effectively dehumidify the air and lower your electricity bills. The appliance is somewhat noisy on a high fan speed. Allowing you to control indoor humidity percentage to provide the ideal moisture level, it will also help eliminate bacteria in the air. Thanks to Ultra-Silence Technology, the motor produces minimum noise even on the highest setting. 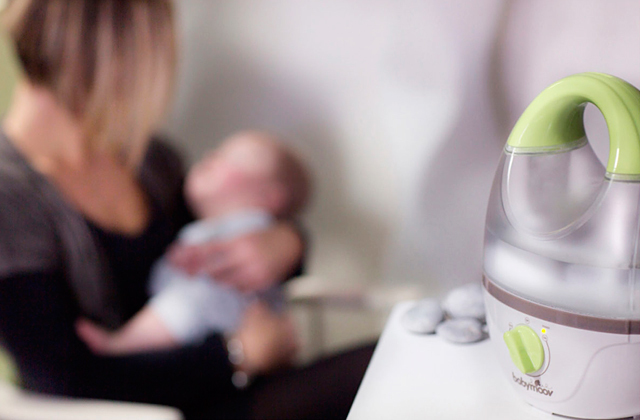 You can use the appliance in a bedroom or nursery, being content that it won't disturb your child's sleep. The instruction manual could be more clear. 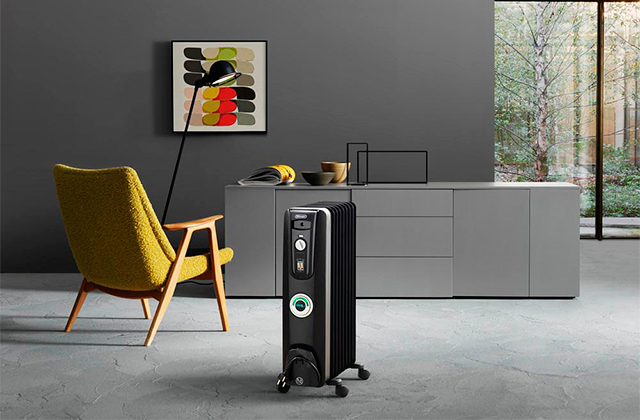 Portable and compact, the Inofia GA2 air dehumidifier will help you get rid of excess moisture and prevent mildew growth in any room of your house. This moderately priced and efficient model has an intuitive operation and an ergonomic carry handle. It goes without saying that a high humidity level provokes the spread of mold and various fungi that are harmful not only to furniture but also to human health. If you face the same kind of problem, Frigidaire Dehumidifier is what you need to decrease moisture level at home quickly and efficiently. Even if you need to control the amount of humidity in large areas, for example, in an office or even a warehouse, you can use this appliance without hesitation since it is capable of removing 70 pints of moisture a day in the area of approximately 4500 square feet. Thanks to three fan speeds (high, medium, and low) and the ability to adjust humidity level within 35% - 85% range, it will be easy for you to maintain the desired microclimate. One more feature that won’t leave you indifferent is low energy consumption of a unit. It’s quite a pleasant bonus taking into account the fact that similar appliances usually consume much more power. High efficiency isn’t the only feature to appreciate. Pay attention to its well-though design as well. 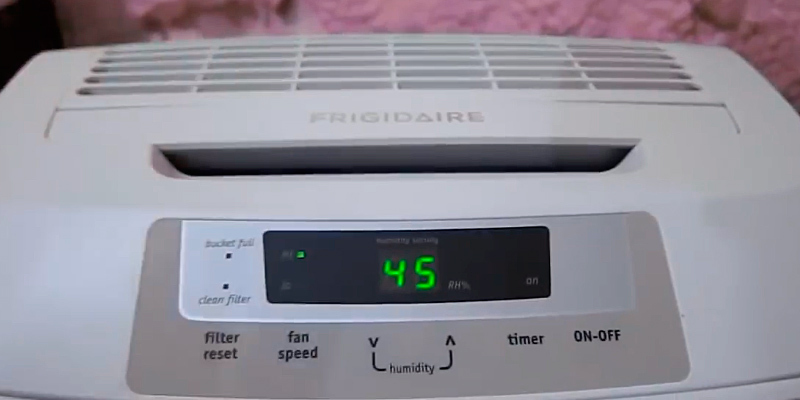 Note Frigidaire dehumidifier is made of high-quality plastic to provide durability for years. As for the control panel, it is situated on the top of the dehumidifier, thus, you can adjust all the settings with ease. The lighting mode is bright enough, and, at the same time, it doesn’t distract your attention. It’s also easy to move the appliance from one room to another owing to caster wheels and handles on the top and the sides. The last but not the least, it's very quiet when in use. 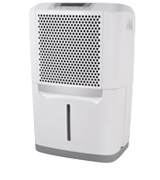 Even working at a high fan speed, Frigidaire Dehumidifier won’t irritate you with unpleasant rumbling noise. Taking into account all the features listed above, we may claim that this model is just perfect. Maintaining an appropriate humidity level is essential for preserving valuables and collectibles. 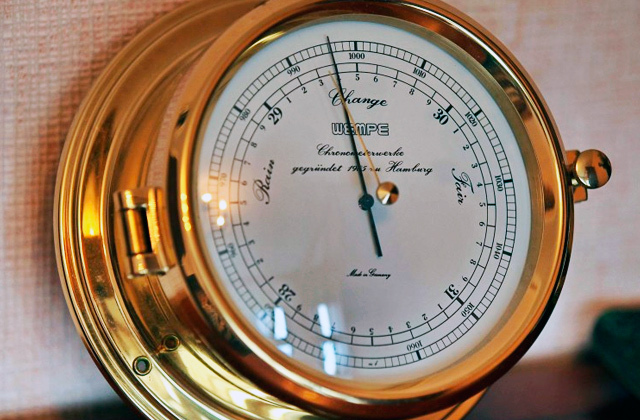 A hygrometer is a handy device that will help you monitor humidity percentage to ensure proper storage conditions of your wines, cigars, and musical instruments. If you are looking for an efficient dehumidifier that will help you remove excess moisture from the air quickly and effectively and could be used in a large room, basement, or cellar, this model is an excellent choice. It is designed for dehumidifying larger spaces (2500 up to 4000 square feet) and can remove up to 70 pints of moisture per day. The unit is Energy Star certified which means it will help you maintain the perfect humidity without using excessive amounts of electricity. This powerful appliance has an elegant sleek design; it features ergonomic built-in handles and is easy to move around on its reliable caster wheels. Equipped with a removable 1.6-gallon water tank, the unit will shut off automatically if the reservoir is full. It also has a drain hose outlet allowing for continuous draining; however, the hose has to be bought additionally (the manufacturer recommends using a ⅝” diameter garden hose). A high-quality dehumidifier not only helps to get rid of excessive moisture; it also eliminates odors and removes allergens from the air. It is just what the hOmeLabs appliance does - keeps the air healthy and clean. 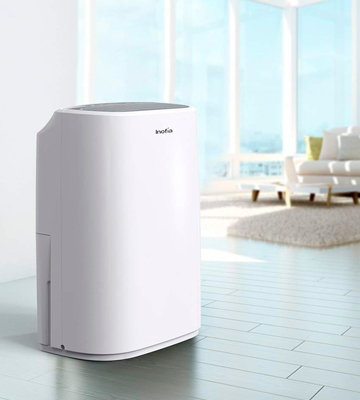 Offering all the functions you would expect in a quality home humidifier, the unit boasts simple operation. It has a user-friendly touch control panel with an LCD display and ergonomic indicator lights. 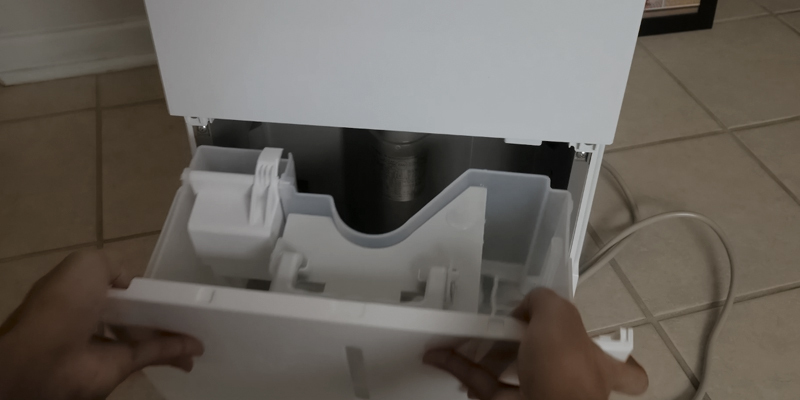 First of all, there is a clean filter light meant to remind you to timely clean the filter; when you have done so, just push the FILTER button to reset it and the light will go off. Next, there is a CONTINUOUS MODE button for activating a continuous dehumidifying operation and a TURBO button for adjusting the fan speed. 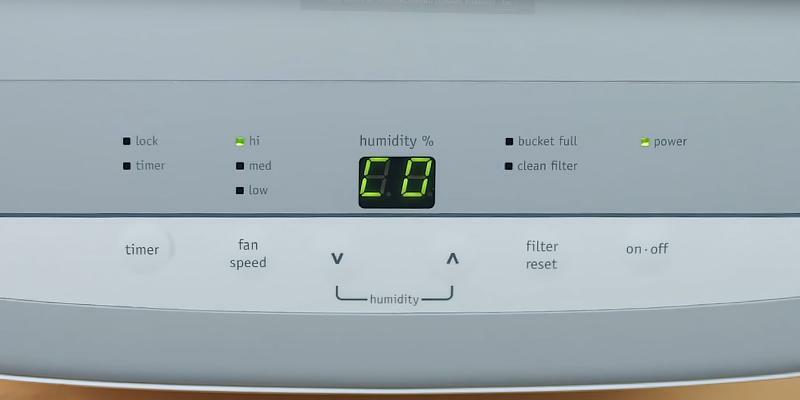 LEFT/RIGHT buttons will help you select the desired humidity level and set the timer (use the TIMER button to initiate unit's Auto start/Auto stop feature). A FULL indicator light will notify you when the tank needs emptying. 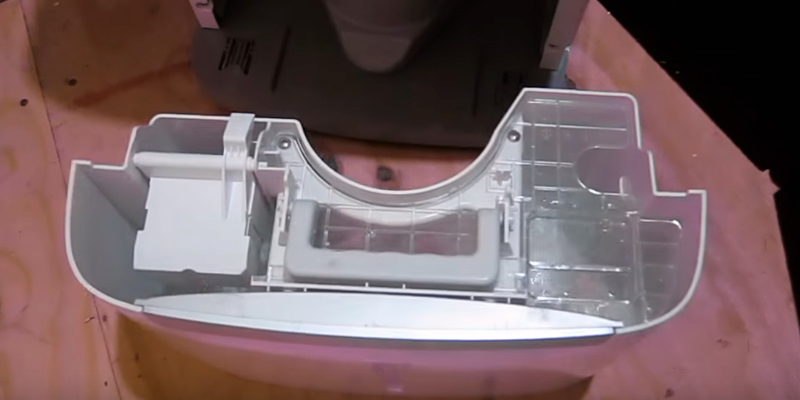 As the appliance features an auto defrost function, there is also an AUTO DEFROST indicator light that will illuminate when the mode is activated. 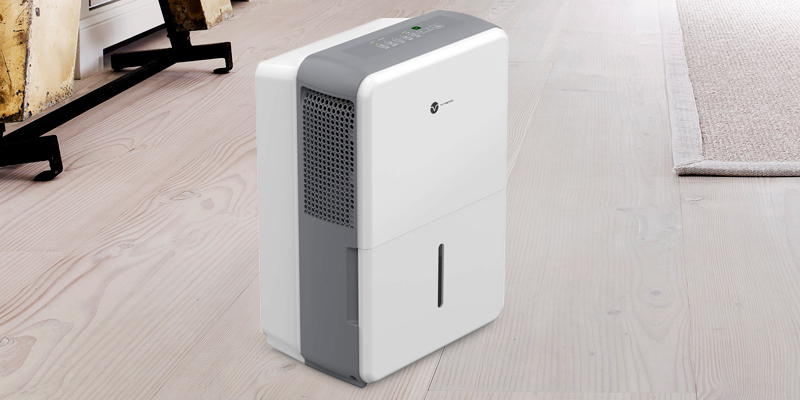 Summing up, if you are looking for a compact and portable yet powerful and efficient appliance to protect your home from mold and mildew as well as to eliminate bacteria and odors, the hOmeLabs HME020031N is the best dehumidifier to go for. To create a special atmosphere at your home and fill it with pleasant natural fragrances, we recommend buying a reed diffuser. If you need to control humidity in up to 1000 square feet area, you do not necessarily need a super-powerful, bulky device. The VREMI 30-pint dehumidifier is perfect for smaller spaces; being quite efficient, it has portable dimensions. The unit features two fan speeds - normal and turbo. The second one will come in handy for super fast air drying; the first one - at all times when you prefer quieter performance and when most of the excess moisture has been removed. The device features an ergonomic control panel and intuitive operation. Just press the power button and turn off the continuous operation (it is preset by default) in case you want to make some adjustments. Then, use right and left arrows to alter the relative humidity level within the range of 35% - 85% RH (with 5% increments) according to your needs. A timer button will allow you to activate an auto start and auto stop feature by using the same buttons with arrows. 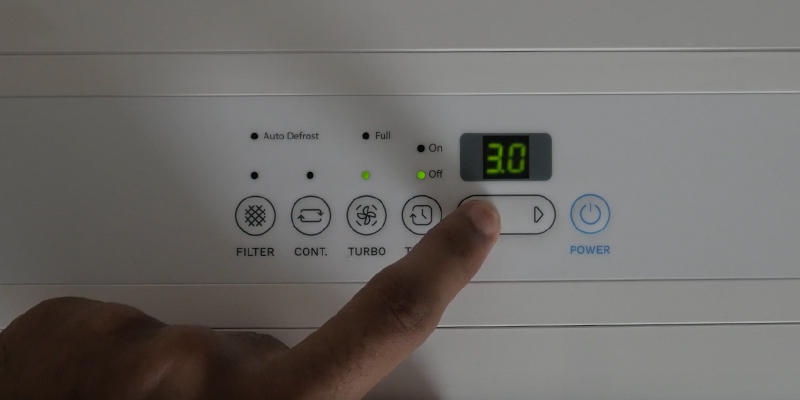 A turbo button will allow you to control the fan speed. A comfort button will make the appliance automatically set the humidity level depending on the room temperature, so you won't have to adjust it manually. 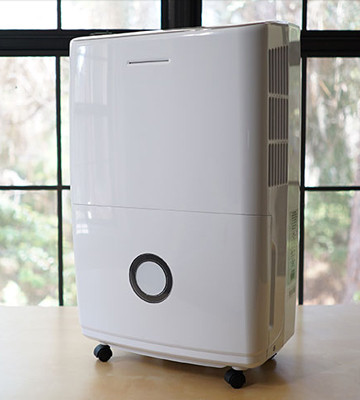 Doing a great job of dehumidifying the air, the unit also helps to remove dirt, dust, mold, mildew, and other harmful particles that can cause allergy and other respiratory problems. This is possible thanks to a high-quality filter the appliance is equipped with. To ensure its flawless performance, it is recommended to wash the filter on a monthly basis. There is also a light indicator that will remind of the procedure every 250 hours of the unit's operation. 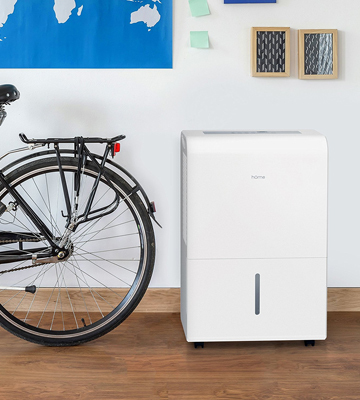 As portable as it is, the appliance features a 0.8-gallon water tank; when the latter is full, the dehumidifier will shut off automatically. A drain hose outlet is also there, so you can get a hose (not included in the box) for continuous draining. The unit itself is pretty lightweight, besides, it has ergonomic wheels for moving it from one room to another. Although the handles might seem a little small, the item is pretty easy to use and carry around. All in all, if you are looking for a room, RV, or basement dehumidifier, this 30-pint model with user-friendly design and handy controls may be just the one you need. Let's look at the Frigidaire FAD504DWD Energy Star model. Designed to improve home environment, it effectively dehumidifies the air - the unit's moisture removal capacity is 50 pints per day. It has an antibacterial mesh filter that helps eliminate airborne particles and bacteria to make breathing more comfortable. With a continuous drain option available, you won't have to empty its water tank now and again; just place the unit near a drain and use a garden hose to discharge the water. This Frigidaire model is Energy Star certified. 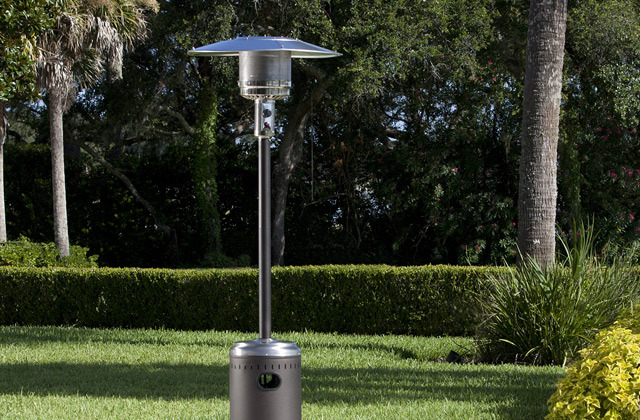 Thoughtfully designed and efficient, it will help reduce power usage and lower your electricity bills. The Frigidaire FAD504DWD features a handy control panel for easy operation. It has an LCD screen and ergonomic buttons for adjusting relative humidity level (from 35% up to 85% with an increment of 5%) and the unit's operation time (you can delay start and stop from half an hour up to 24 hours). 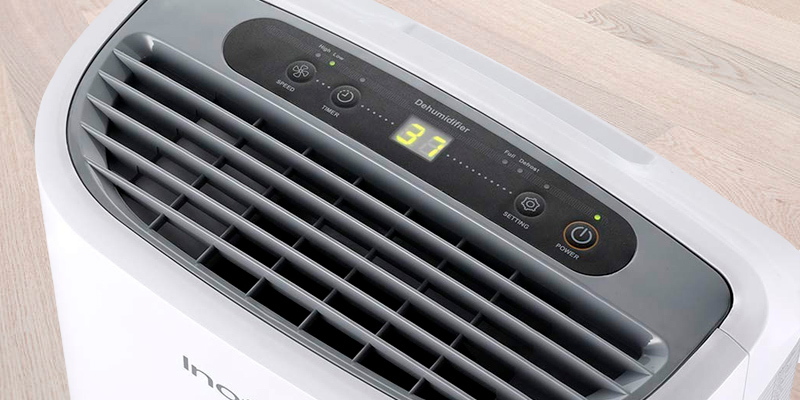 Next, you can customize the fan speed (choose the high setting for quicker moisture removal). Finally, this model has a 'bucket full' and 'clean filter' indicator lights. The first one will show you when it is time to drain the water tank; the second one will appear every 250 hours, reminding you to clean the filter. Boasting a 50 pints/day moisture removal capacity, the appliance has a large water bucket, equipped with a handy carrying handle and splash guard for hassle-free emptying. The collection container has an ergonomic level indicator; when the water tank is full, the dehumidifier will shut off automatically. The unit has a portable design; it is equipped with ergonomic top and side handles and four caster wheels to move it around your house. In addition, the appliance is easy to clean: just wash the bucket with warm water and some detergent, wipe the housing with a damp cloth, and wash the antibacterial filter with clean water as needed. 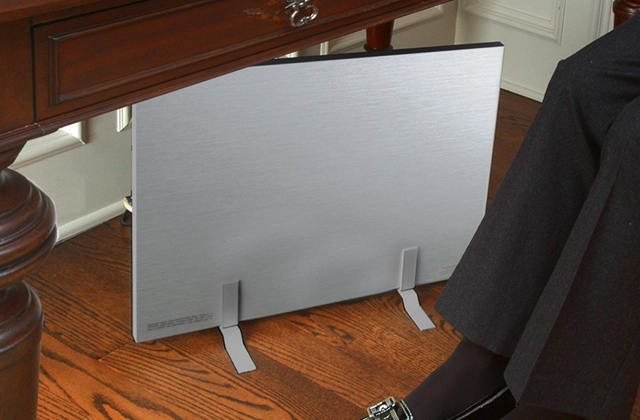 To make your room, office, or garage a comfortable place when it gets chilly outside, get a portable space heater. 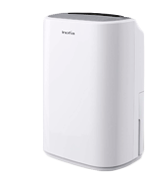 The Inofia GA2 is one of the best dehumidifiers for home use. It is powerful enough to create perfect humidity conditions in up to 1056 sq. ft. indoor space; at the same time, it is quiet, compact and reliable. With the user's safety in mind, the unit features overload protection; the inner tube is made of heat-resistant materials (glass fiber and silicone). A high-quality pump compressor will guarantee consistent performance and long service life of the unit. 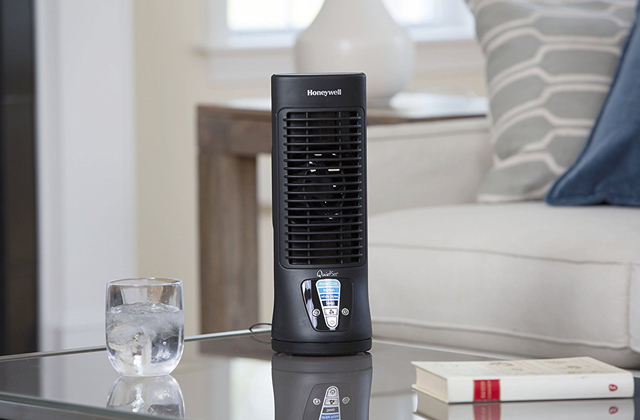 The dehumidifier has an upward air outlet which will provide a rapid air release. 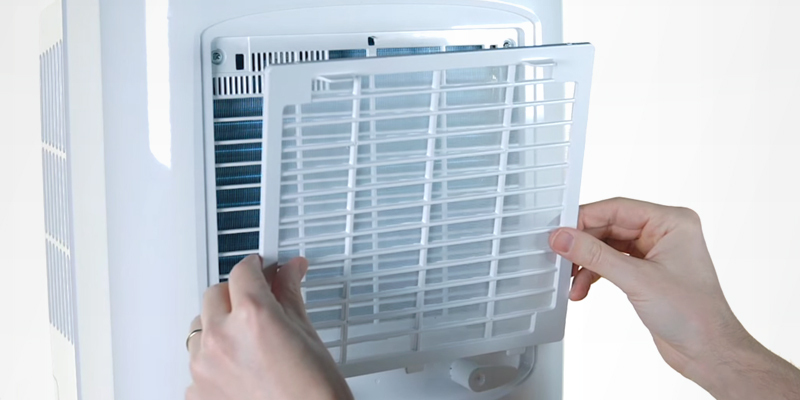 To make sure the air becomes not only less humid but also dust and mold free, the appliance is equipped with an air filter, which is recommended to clean every 2-4 weeks. The only downside of this model is that the water tank is somewhat small compared to its competitors. However, it is quite forgivable for a unit with such a sleek and portable design. Besides, if you do not like the idea of emptying the water tank, you can use its draining outlet. Luckily, the manufacturer has included a 2-meter draining hose, so you won't have to buy one additionally. If for some reason, you can't use an automatic draining option, there is a handy auto-stop function that activates when the water container is full. You will also be notified with an alarm and flashing signals when this happens. The tank is very easy to remove and empty, and it is not heavy, too. 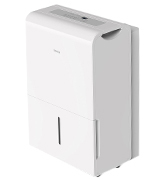 If you are looking for a really quiet dehumidifier, the Inofia GA2 is an excellent choice. It produces minimum noise, that is why this model is recommended for use in literally any room of your house, including your child's bedroom. It is also a great choice for RVers and basements owing to its portable size. Though the unit has no wheels, it is compact and lightweight, and it has a comfy built-in handle. We should admit that this model has a pretty straightforward control panel - it has but four buttons and an LCD screen. Yet, it will allow you to control all the important parameters, such as fan speed (high or low), the unit's on/off time, and the desired humidity level. Setting the fan speed on a high level, you will be able to remove the water from the air faster. A 24-hour timer setting will give you full control over an air-drying process. 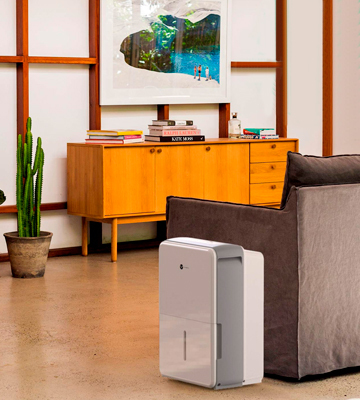 All in all, this compact, functional, and energy-efficient dehumidifier is a great device for creating a healthy indoor environment in high humidity conditions. There's always humidity in the air, but what can you do if it's too much? Humid air is a great environment for the growth of fungi, mold, unpleasant smells, and so on. 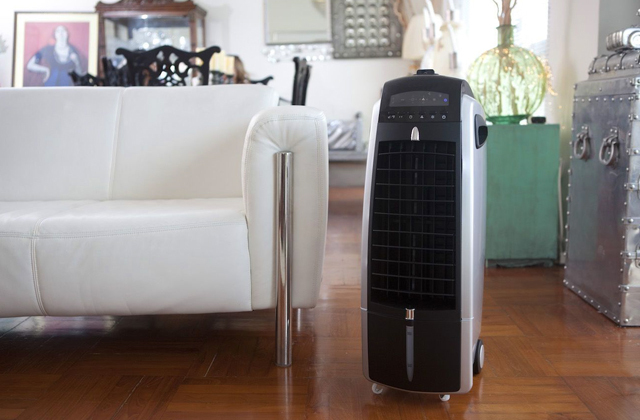 All of it has a really negative impact on your health and the only way to solve this problem is to make the air less humid with the help of a special appliance such as dehumidifier. 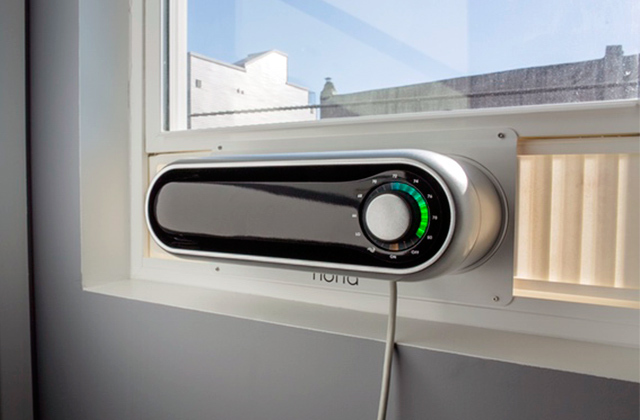 It was designed to remove excess moisture from the air and maintain the desired humidity level. This will help to prevent mold and mildew growth and even eliminate odors, bacteria, and allergens. We have reviewed the top rated dehumidifiers to help you choose the appliance that suits you best. 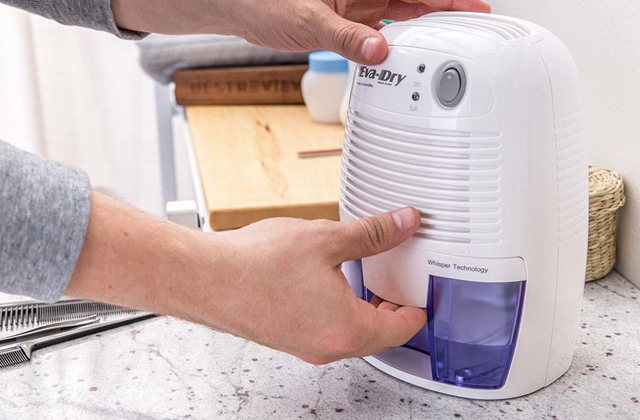 However, if the air in your house is, on the contrary, too dry - make sure to check out our shortlist of the best humidifiers that will help you make the air more humid. 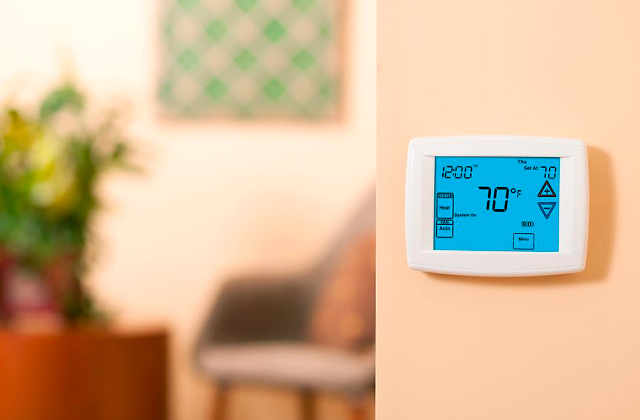 If you are looking for a handy device for controlling the HVAC systems operation, we recommend getting a digital thermostat you will find in our review here. The first aspect that you need to consider before you buy a dehumidifier is the model performance which depends on its dehumidifying capacity, that is, the amount of water that an appliance is able to squeeze from the air. This parameter is measured in pints per day (24 hours). Not only can a humidifier allow you to get rid of excess moisture in a living room but it is also used to maintain humidity at an optimal level. 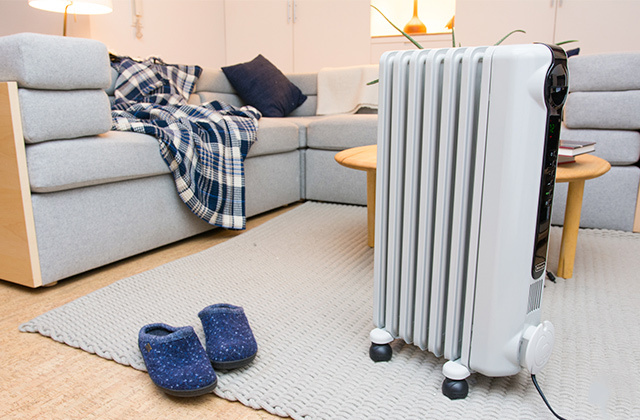 A powerful dehumidifier will be able to remove excess moisture fast enough, even if placed in a rather large room or basement, without overheating. In order to choose a dehumidifier that will be suitable for you, we suggest you also consider the coverage area specified by the manufacturer. Which one will be best for you will depend on where you plan to place it. It goes without saying that a device should be easy and convenient to use. With that in mind, most dehumidifiers come with a bunch of additional features aimed at helping you operate it. For instance, a built-in humidistat is often added to let you monitor and maintain the indoor humidity level with greater convenience. A timer is another useful feature presented to reduce electricity bills and ensure that the atmosphere in your home is always nice when you get back home. Furthermore, a lot of dehumidifiers feature a special water tank level indicator that will keep you aware of when the device needs emptying. Last but not least, the market offers a great number of models with electronic controls; these are considered the most user-friendly and convenient to use, thanks to simpler controls and informative LCD screen showing all information. 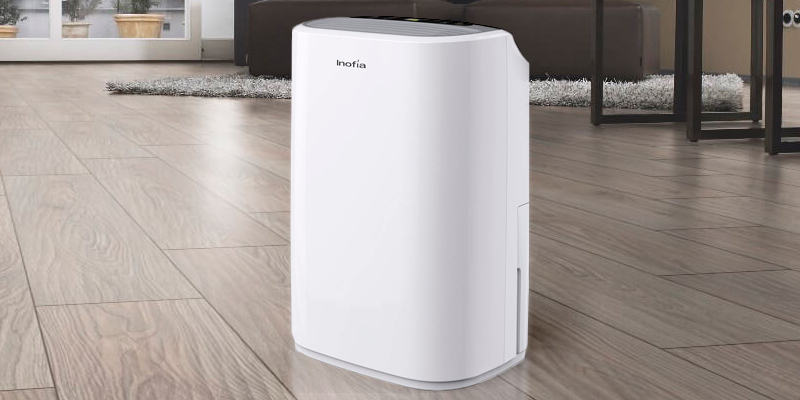 Designed to remove excess moisture from the air, most dehumidifiers also have filters to eliminate airborne particles; there are even models equipped with ultra-violet lamps that kill bacteria in the air. We recommend choosing an appliance with a washable filter that can be removed, cleaned and replaced. Keep in mind that maintaining the filter regularly can greatly prolong the lifespan of the unit on the whole. Of course, not all dehumidifiers have filters. There are simpler models as well, which are suitable for installation in cellars, basements as well as in living rooms of those people who don't have any breathing problems (asthma, for example, etc.). Finally, consider convenience features. By this, we mean a lot of things. 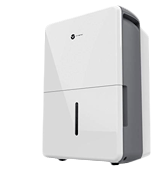 One of them is where a dehumidifier can be placed: there are both portable and wall mounted models available. Another one is the size. 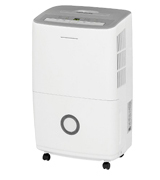 The good thing is, dehumidifiers come in various sizes so it should be easy to pick one that will fit your place best. A small/compact model, for example, will be perfect for bedrooms, nurseries, small cellars, basements and the like while a bigger model will be ideal for open space offices, large living and guest rooms, the list goes on. If you opt for the latter, make sure the unit has an ergonomic design and caster wheels for mobility. Another thing that's worth checking out is the drainage type. It will tell you how long the appliance can be used without emptying. Dehumidifiers with direct drainage system, for example, can be used round-the-clock, since they drain water out right into the sewage. Some of these models may even have pumps helping force water out further on. In case you choose a dehumidifier without direct drainage system, it's essential to check its tank capacity. Naturally, if you plan to run it often, it is reasonable to make sure that the tank allows for collecting enough water. 1. Dehumidifier Buying Guide, Lowe's. 2. How To Choose the Right Size Dehumidifier, Sylvane. 3. How to Choose the Size of a Dehumidifier, wikiHow. 4. 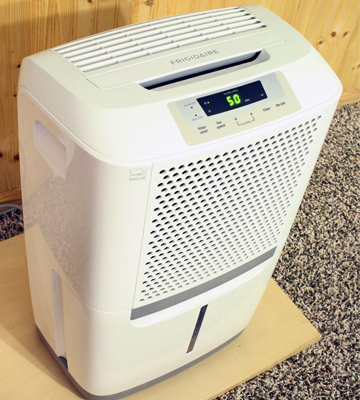 2 Things You Need to Know to Choose the Right Dehumidifier, air & water. 5. 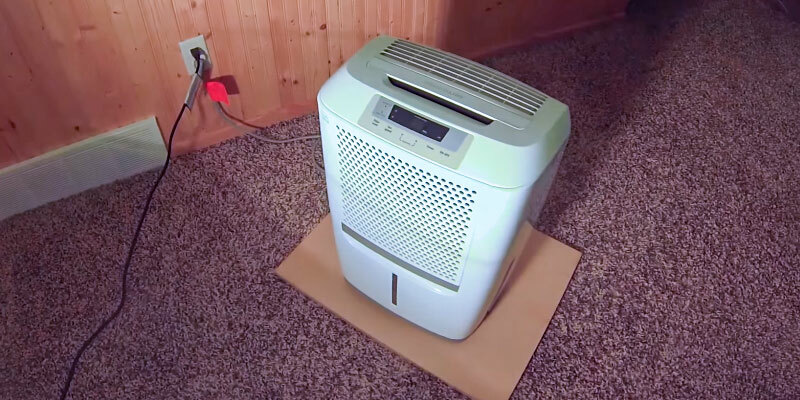 John D. Wagner How to Choose a Dehumidifier, This Old House. 6. Dehumidifier Buying Guide, Consumer Reports. September 2016. 7. Don Vandervort Dehumidifiers Buying Guide, Home Tips. August 15, 2016. 8. 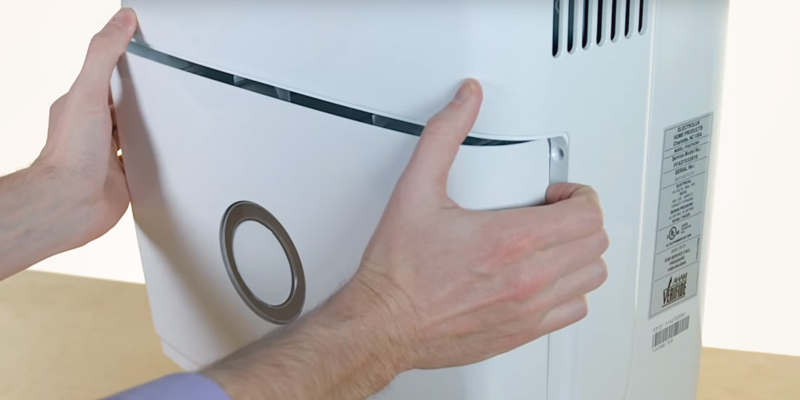 Oli McKean How to Buy the Best Dehumidifier, Which? 9. 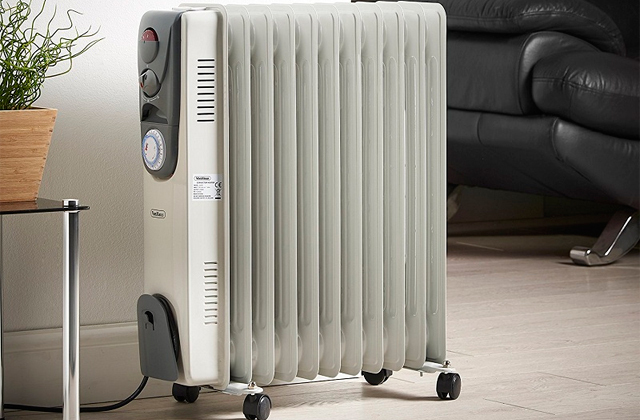 Mariette Mifflin 10 Things to Know About Buying a Dehumidifier, About.